Those are gorgeous! Do they come out looking like that? Hi Setsu – they do indeed! 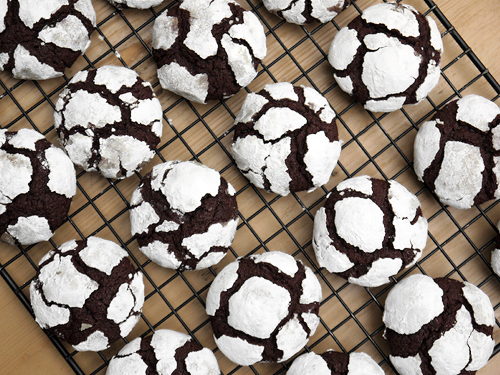 They go in looking like perfect little snowballs, then crack during baking. I was sitting next to the oven, peering through the glass to watch what happened, really it’s just like magic! I’m so excited to try this. Thanks for posting! They are stunning, must try them some time soon. I can’t have hazelnuts, but I think almonds could work too, don’t you? You’re totally right on that one. These look pretty delicious! And they’re perfectly crackled – beautiful! Thanks Gab. I didn’t know if they would work, so found myself kneeling next to the oven, peering inside and watching for the cracks to appear. They almost remind me of jewellery… looks delicious! I guess they could…big chunky festive beads? Never heard of these, but my they look good!!! I know what you mean…they are not so common in Britain either, but big in the States. Wow! They look like miniature frozen worlds….just beautiful! What a great way to see them. Thanks! I’m totally impressed with your dedication! Last year I did the 12 days of Christmas baking and I just couldn’t motivate myself to do it again this year. These cookies look delicious, I’m looking forward to seeing more baked confections!! Hi Heather. I know what you mean, it can get a little bit frantic. I found there was a bit of a panic in the last few days, as I try to get all twelve recipes done before Christmas day. This year I have been a little less ambitious – I did a lot of research in November so that I’d be good to go when December arrived. Glad you’re looking forward to them – I think I’ve got a good selection in the pipeline. love this x’mas tradition of yours =) thx so much for sharing. Glad you like it. It’s quite fun to search across different baking cultures for new ideas every year. Hi Shanna – basically, they are that delicious!